Over the last year, we granted a handful of iOS and Android developers limited access to Clarifai’s Mobile SDKs, giving them the chance to harness the power of computer vision in the palm of their hand. Through their feedback, our team of computer vision and machine learning experts have worked hard to continually hone and improve the SDKs for all our users. And today, we’re excited to announce that the new and improved Clarifai EDGE SDKs for Android and iOS are now available for general use! With our SDK for IoT (internet of things) devices soon to be released, our EDGE SDKs are now three of the five options Clarifai offers to power your computer vision AI. Unlike our Cloud API or On-Premises options, however, the EDGE SDKs are for your mobile or edge devices and don’t rely on them being connected to the cloud or a private server. Rather, the EDGE SDKs allow you to embed our computer vision capabilities directly in your edge devices themselves, even without internet access. While just under half the world still has no access to the internet, almost 70% of the world population owns a mobile device. Now, with Clarifai’s EDGE SDKs, having such a device may be all you need to leverage the latest advances in machine learning and computer vision. When paired Cloud API, the EDGE SDKs can take advantage of custom model training, enabling you to create and train a custom computer vision model to recognize concepts that are unique to you! 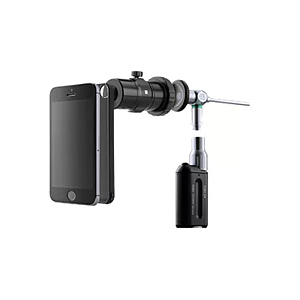 i-Nside, our initial EDGE SDK launch partner, used these capabilities to power their smartphone attachment to see, learn and accurately diagnose hundreds of inner ear diseases. Now their tool is helping to augment medical professionals in even the most remote corners of the world. Whether you want to efficiently and automatically tag your images or moderate your user-generated content, Clarifai’s EDGE SDKs enables you to build smart apps with computer vision embedded for real-time processing. Once you reconnect your edge devices to the internet, your apps will access the aggregate learning from Clarifai Cloud, making every device with your app a little smarter.